U.S. 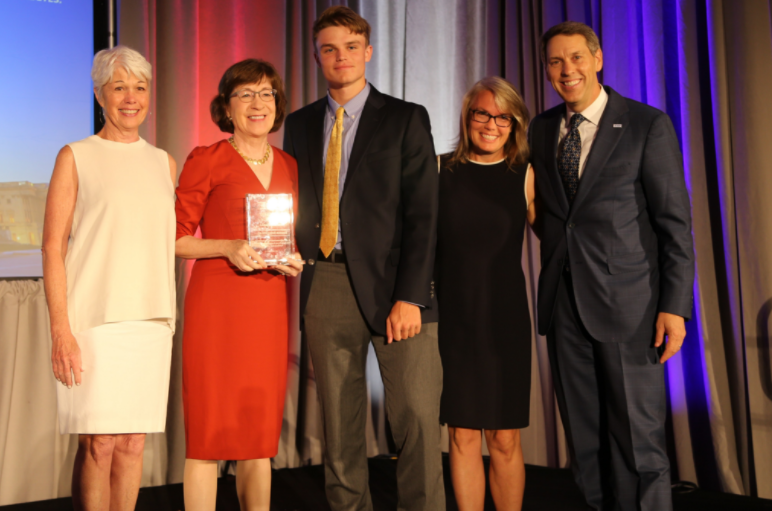 Senator Susan Collins recently received the JDRF Trailblazer Award for her efforts to increase funding for diabetes research and treatment. Joining her was YHS senior Cole Buchanan, a former page; and Brian Shankey, the JDRF Executive Director for Maine. “With the strong support and advocacy of JDRF chapters across the country, I am confident that we will conquer this terrible disease,” said Senator Collins. “I was delighted to see that Cole Buchanan, a former page of mine, was doing so well managing his Type 1 diabetes and to hear about his new treatment methods,” Senator Collins continued. The Yarmouth streak continues, as YHS junior Ellie Ralph will serve as a page for Senator Collins this year. This will be the third year in a row a Yarmouth student has participated in the semester-long internship program with the United States Senate.